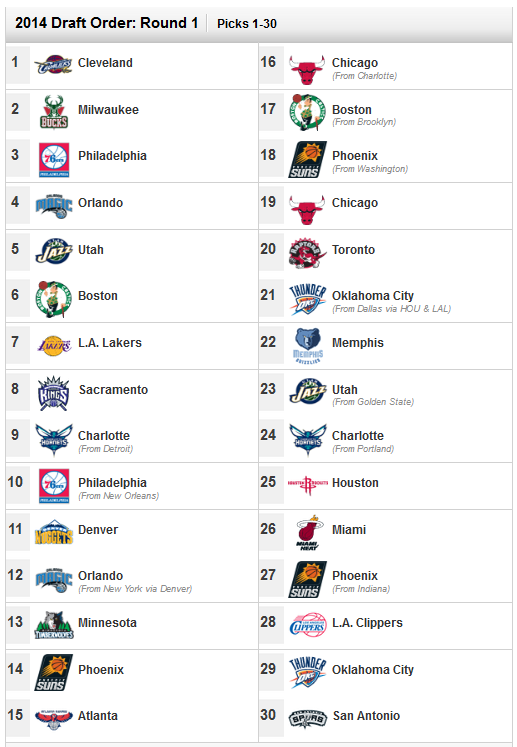 With the 2014 NBA Draft set to take place on Thursday, June 26 which is just a little over a week away I realize I am late to the NBA Mock Draft party (ESPN’s Chad Ford just put up his Mock Draft 8.0). I waited until know to make some predictions of who will be drafted when because who really cared about the draft while the NBA Finals were going on (Go Spurs!). With that being said here is my Mock Draft Zocc.0 (pronounced zock-point-oh), which is a little different than all the other mock drafts out there because mine includes trades. The current draft order (before any of my predicted trades) is the picture about the article in an attempt to not confuse you too much. So here goes nothing. Enjoy my mock and get ready for a crazy draft night on June 26! Phoenix has three first round picks (14, 18, 27) and does not want to add three rookies to an already young roster. Either a trade or the Suns will draft a player and stash them overseas. Other teams with more than one pick in the first round of this draft (Utah, Chicago, Charlotte, Oklahoma City) will be in talks with teams that do not have a first round pick (Knicks, Nets, Pelicans) to trade into the first round. The Cavaliers want to trade this pick hopefully for Kevin Love or a player of that caliber. Owner Dan Gilbert wants to win now so another rookie really does not help his cause. I think the Cavs do not have enough to offer Minnesota for Love and therefore do not find a trade where trading this pick is worth it. As much as it will kill Gilbert to take a player who will need a few years to develop Embiid could the best player out of this stacked draft years down the road and he will fit nicely on the court next to Kyrie Irving. SBNation.com reported that Andrew Wiggins in not in the Bucks top two of their big board which makes this pick an easy decision. Wiggins is too similar to a young and athletic player they already have, Giannis Antentokounmpo (please don’t spell check that name). Drafting Wiggins could hinder the Greek Freak’s development so taking a more NBA-ready Parker here seems like a good fit. I have not heard many reports about this but am I the only one that thinks Milwaukee should maybe try to move back and stock pile picks in this deep draft? They are still a few years away from competing so it should at least be discussed. All the talk of the Sixers moving up to number one to make sure they get Wiggins could go out the window if the Cavs choose Embiid. Could a Thaddeus Young and No. 3 pick to Cleveland for the No. 1 pick still happen? Sure. It would just be perfect for Wiggins to fall to them at No. 3. The Sixers are just looking to add talent to a young team and Wiggins is who they like out of everyone. Seems like a match made in heaven for both Wiggins and the Sixers. And this is where the draft gets interesting. Happy 2014 Draft everyone! The Magic have been searching for a point guard for a couple years now. It was Marcus Smart last year who stayed in school leading to Orlando taking Oladipo at No. 2 which seems to a great choice. This year Exum falls in their lap who is being compared to Michael Carter-Williams, the rookie of the year this past season. A backcourt of Exum and Oladipo could be a force in the East for years to come. The Jazz do not necessarily need another big man as they have Derrick Favors and Enes Kanter still on their young roster, but I believe they take the best player left in their opinion who will be Vonleh. It wouldn’t surprise me to see the Jazz take Marcus Smart here and pair him in the backcourt with last years pick Trey Burke. While both play point guard both can play off the ball and Smart is big enough to play defense on the opposing teams shooting guard. Either pick makes sense for a team that still needs a little bit of everything. As mentioned above the T’Wolves get this pick from the Celtics as part of the Kevin Love trade Minnesota keeps saying it won’t do before the draft. I call BS and think they will trade Love on draft night, or at least they should trade him on draft night and get all they can for him. After this fake trade Minnesota now has three picks in the first round (6, 13, 17) and can start the rebuild with a young core from a deep draft. Who better to replace Love at power forward than Gordon who is compared to Blake Griffin with a better jump shot. If Boston keeps the pick I think they also take Gordon. The Lakers, like the Celtics, are looking to move this pick as they want to keep cap space available for free agents. I just have no idea who the Lakers would trade this pick too and still get something of value in return. If they keep the pick and Smart is on the board I think it is a good fit. Smart is a big, physical point guard that can develop into the point guard of a championship contender. This is a lose-lose right now for the Kings: they too would like to move the pick for veteran help or I think would like to draft Smart to play next to Isaiah Thomas who went the pick before. If the Kings pick here I think they go best wing player left who in my opinion is Harris or Nik Stauskus. Harris should be a better overall player as Stauskus is a better catch-and-shoot player. Harris could fit right in and be a great scoring option and sixth man for this team. The Hornets (formerly the Bobcats) were a young playoff team last season who showed a lot of promise and now get two picks in the first round this year thanks to Pistons and the Ben Gordon trade. This is a huge pick for a team that could use some scoring period. McDermott fits that perfectly as a forward who could play down low next to Al Jefferson if needed and spread the floor. This Bobcats I mean Hornets team could be a good young team in the East next season. What a steal this would be the Philly if they could leave the draft with both Wiggins and Randle to go with their two first round picks last year (Carter-Williams and Nerlens Noel – thanks Jrue Holiday and New Orleans). It looks like Randle could slide to them at No. 10 with the concerns over his foot that Randle says are not a concern at all. Wouldn’t be surprised if someone trades with the Kings and moves into the No. 8 spot to take Randle, or even if Charlotte did at No. 9. I do not think Randle falls past Philly here though as a starting lineup of Carter-Williams, Wiggins, Randle and Noel could be scary good in a couple years. The Nuggets are another team that do not want to add any more young talent to already young roster so they will be looking to trade this pick. Once again I am just not sure who they would trade with and what they can get in return. If they stay and choose a player I think it would have to be Stauskus who has a lot of offensive potential and could be the next great sharp shooter. This seems like a great fit for Orlando who already chose Exum at No. 4. Saric is being compared to Hedo Turkoglu who was a big part of the Magic’s success when Dwight Howard still roamed the post. Saric next to Oladipo and Exum makes sense as Saric can stretch the floor and make 3s. I think this is the way the Magic go here at No. 12 unless one of the players I have being drafted falls to them here (cough cough Julius Randle). The T’Wolves with their second of three picks in this draft after the fake Kevin Love trade to the Celtics would draft best player here and Young is that player. He has developed a lot in this past season at Kentucky and was a big reason why they made it to the National Championship game. His jump shot continues to improve and should be a good perimeter defender at the next level. I know the Suns already have two points guards in Eric Bledsoe and Goran Dragic, but with three first round picks in this draft if they keep the pick they will take the best player left. LaVine is 6’6″ and only 19 years old. He is athletic and can shoot it with the best of them in this draft. He has a chance to be a good guard, both point and shooting, in the years to come. Wouldn’t it be great to see the Canadian Ennis fall to the Raports and give that city and team even more of a reason to be excited? They already have a young core and bringing point guard Kyle Lowry back is an important signing I believe they will get done, but drafting Ennis to back up and even sometimes play next to Lowry could make this team even more dangerous. Okay, as a UConn fan I may be a little biased when I think this would be a great fit. I do believe that Phil Jackson will move into the first round by using Iman Shumpert as trade bait. The Shumpert to OKC talks were happening last year at the trade deadline so it would not surprise me to see the deal actually get done at the draft. The UConn fan in me just hopes that if Napier falls past Toronto and Chicago and gets to No. 21 that Phil pulls the trigger and makes the trade to get him. McGary was a lottery pick in last years draft and has that much talent and potential. He feels like someone the Spurs would take a chance on, but this year the Clippers get to him first as they really need help in the front court next to DeAndre Jordan and Blake Griffin. I believe whatever pick OKC makes in this draft will be to add a wing scorer or athletic wing player. Adams fits this need as the Thunder will likely trying to replacing Thabo Sefolosha this offseason. No one really knows what Capela can give an NBA team so this is the perfect player for the Spurs to take a chance on here at the last pick of the first round. Oh yeah the Spurs also have a pretty good track record of being right when drafting players from overseas (you can add Goran Dragic to that list. He was drafted 45 overall by San Antonio in 2008). This entry was posted in Draft / Offseason, Home, NBA and tagged 2014 NBA Draft, Aaron Gordon, Andrew Wiggins, Charlotte Hornets, Dante Exum, Doug McDermott, Iman Shumpert, Jabari Parker, Joel Embiid, Joey Zocco, Julius Randle, Kevin Love, Marcus Smart, Minnesota Timberwolves, Mock Draft, Mock Draft Zocc.0, NBA, NBA Mock Draft, New York Knicks, Noah Vonleh, Phil Jackson, Shabazz Napier, trades, Tyler Ennis, UConn, Wiggins. Bookmark the permalink.